Sweet bhi Spicy Bhi, West is Best! When you read “best of the west” on the food festival poster of Novotel Shamshabad, you may be excused for thinking about food from the western hemisphere, you know the Americas, parts of Europe etc. Then you glance down to see Gujarat, Maharastra and Rajasthan (a bit of creative liberty there as Rajasthan is really more in northwestern India, it should have included Goa, you think) and you go bingo! The festively decorated entrance at Square, the all-day dining at Novotel Shamshabad. Coming back to the event, the ambience created was perfect, right from the entrance. Rajasthani puppets, colorful festoons, waiters in leheriya pagdis and waistcoat jackets…the feel was pucca Mharo Des! The Handvo is delicious and is followed by Fish Koliwada, the popular spicy boneless fish starter from Maharashtra and I discover that they have used the locally available murrel fish instead of the traditonal rawas or Indian salmon. So far, so good! We follow it up with some Pav Bhajji and this is excellent stuff, the bite-sized pavs are crisply fried in butter (what else?) 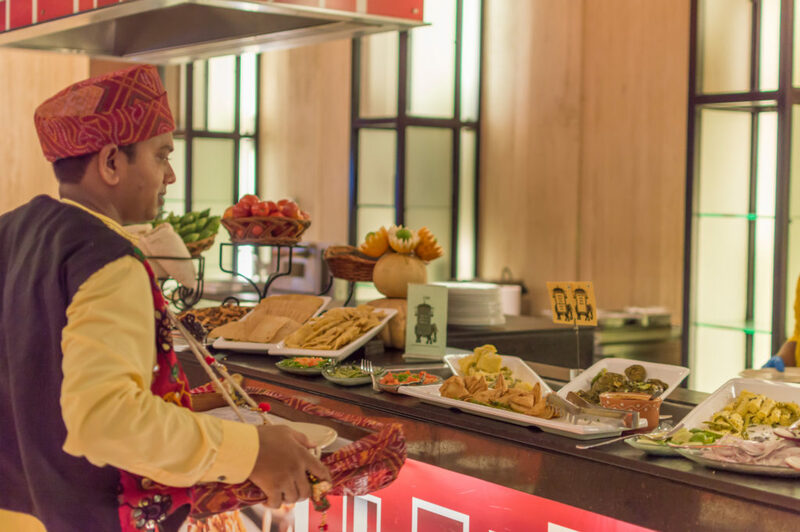 and the Bhajji is spicy and super delicious, the kind which is addictive, but I decide to turn my back on a second helping, as there is an enormous spread on the buffet. 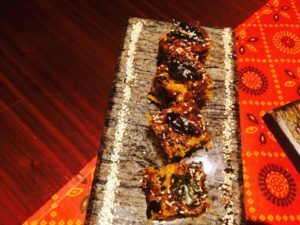 The surprise element in the main courses is the fiery-hued Paneer Koliwada, which turns out to be super spicy, pungent and the stuff that legends are made of. Let it be said that I am not a fan of paneer but this one is kickass stuff!So is Saoji Chicken Curry, a traditional dish from Nagpur, with the curry consisting of coconut paste, khus khus paste and other spices. There is the more toned-down Turiya Patra, ridge-gourd and patra (that delicious steamed besan-covered colocassia leaf Gujarati special) tossed together, with a khatta-meetha aftertaste, thanks to the lemon juice, sugar and til in the garnish. For something Rajasthani, we try Gatte Ki Subzi, (besan dumplings in an yoghurt base) which is strictly ok. We team up the curries with some bajra rotis although I try in vain to find some typical western Indian breads like the Gujarati methi theplas or rotlas (the tiny rotis served with a smear of ghee on top), or the Marathi thalipeeth and jowar rotis. Undhiyu, which is a winter seasonal special, is also featured on the buffet, but turns out to be quite disappointing. Neither is there any Surti papdi in it nor are there enough vegetables like yam etc. The muthiyas (steamed besan dumplings) which are traditionally added to the dish are not cooked properly and to add to it, there are no puris served with Undhiyu! But Dal Dhokli, a Gujarati dal and atta or wheat flour dumpling delight more than makes up for the no-show Undhiyu very well. 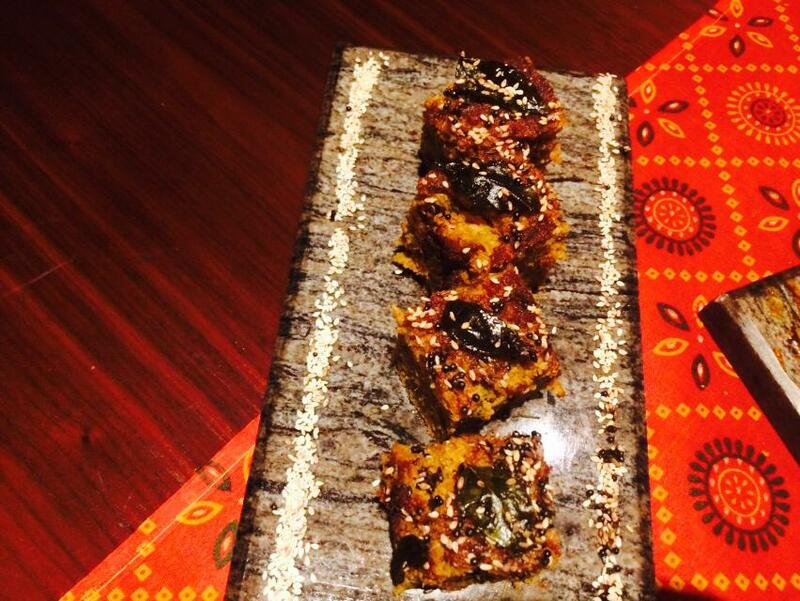 Its chatpata, meetha and has boiled peanuts and the Dhokli or the atta dumplings are perfectly al dente. Soul food and one pot meal. “This is our Gujarati version of pasta in a sauce,” laughs off Tulshi and I cant agree more, adding that its one of the tastiest pastas I have had. 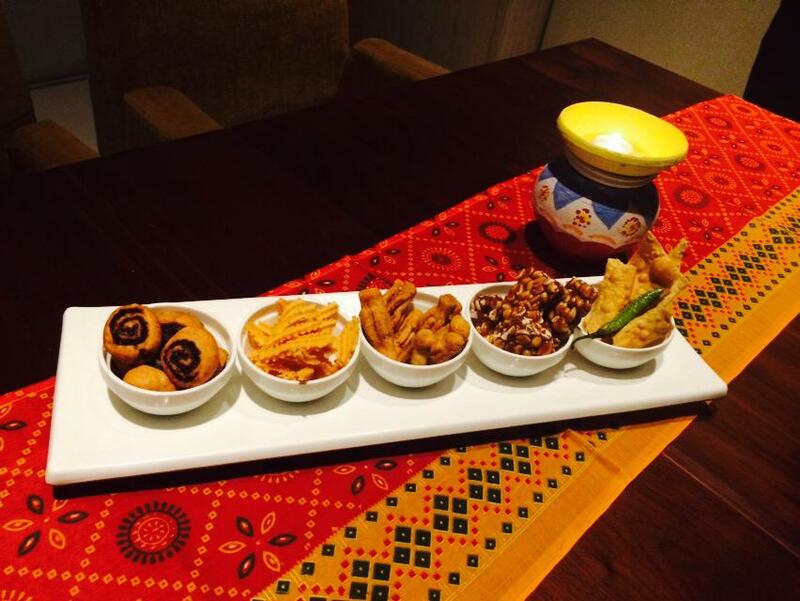 Desserts time and its the turn of the Rajasthani ghevar to show its magic. 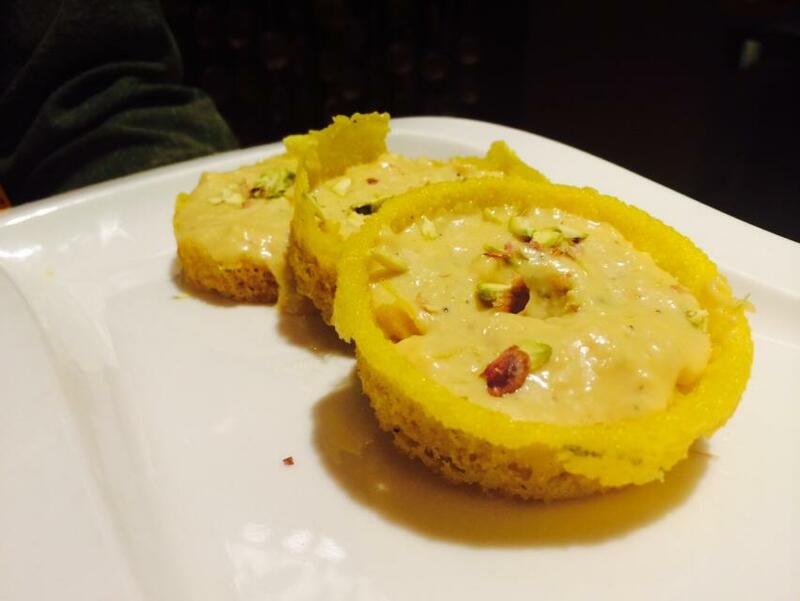 Crisp to the outer edges and absolutely soft and malai-creamy to the inside, the saffron-colured ghevar, (mercifully not overtly sweet) does not disappoint at all! There is also a plated platter of different types of laddus, til, murmura, rajgira etc but I can barely try a bite of it after such a huge meal! Ghewar Rajasthan ka: Kamaal ka ! Crisp on the outer edges, soft and deliciously creamy on the insides…yummy! My takeaway from the meal? A kaleidoscope into he spiciness of Marathwada region, the earthy robustness of Rajasthan & the subtle textures of Gujarat, all come together in this pretty comprehensive food showcasing of Western India. It’s looking awesome and willing to eat. yummy dessert.